I recently had the good fortune to participate in an offshore excursion aboard the University of Washington’s new research vessel, the R/V Rachel Carson. I joined fellow students of the Oceanography 201 lab to gather and examine water samples from Puget Sound. As the second largest estuary in the United States, the Puget Sound’s unique characteristics provide fertile waters for a wide variety of marine life. Once covered by an ice sheet a mile thick, the retreating glacier left behind a fjord that today helped Washington state’s commercial fishing and seafood processing sector generate $9.4 billion in revenue in 2015 (Washington State Economic Impact Study). But the region’s rapid growth is creating more stress on the marine environment — one already facing the global stress of rising sea temperatures and ocean acidification, which, of course, are threatening marine life worldwide. Puget Sound waters are particularly susceptible to ocean acidification, and that is bad news not only for the thriving shellfish industry, but also for the tiny marine life that sustain juvenile salmon during their critical growth cycle. 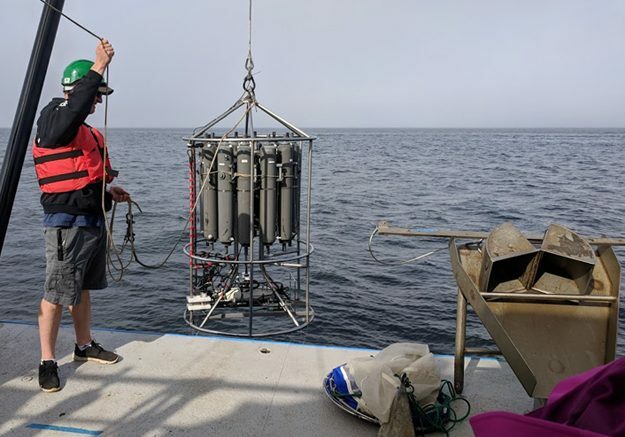 Ocean acidification, undeniably caused by humans, makes it difficult for shellfish and smaller organisms to produce their shells, and experiments at the Northwest Fisheries Science Center found that increased ocean acidity also reduces the survival rate of Dungeness crab larvae. 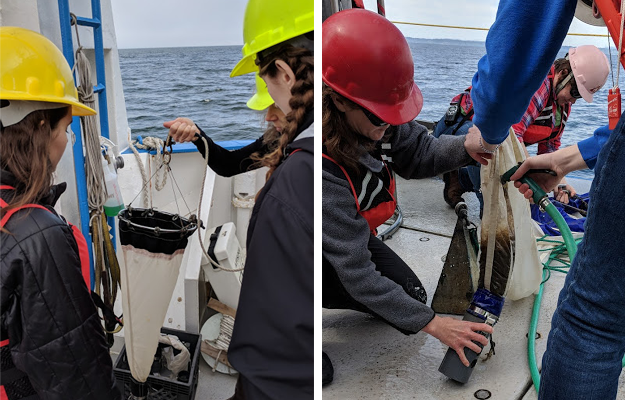 From aboard the Rachel Carson we took water samples from various depths, measuring pH levels (acidity), water temperature, salinity, oxygen, and phytoplankton, which are the base of the marine food web and generate about 50 percent of the planet’s oxygen. The CTD Rosette pictured at the top of this post gathered this data from Puget Sound. The water’s acidity, measured in pH, is the green line on the left graph. 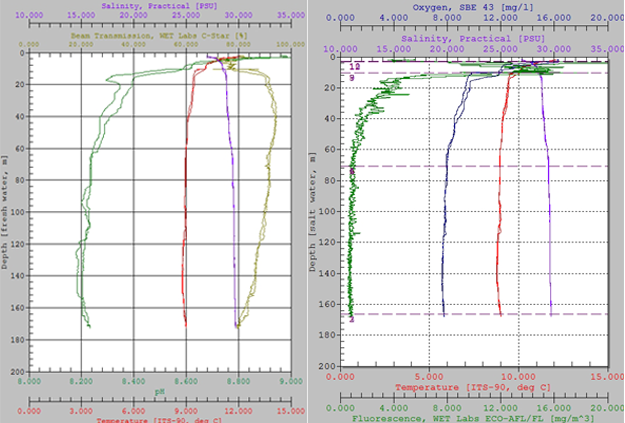 The darker green line on the right graph represents fluorescence, an indicator of phytoplankton. The greatest changes occur near the surface waters of Puget Sound, where sunlit waters help fuel oxygen-producing photosynthesis. One tiny organism, pteropods, are a crucial source of food for salmon. But as more carbon enters the atmosphere and increases ocean acidity, pteropod survival is threatened, which results in less food to support juvenile salmon. If the young salmon don’t survive, or enter their ocean odyssey in a weakened condition, the chances for survival of the species are significantly reduced. Unlike natural selection, there is nothing natural about the extent to which we are pumping carbon into the atmosphere, directly contributing to ocean acidification and anthropogenic global warming, and, in turn, disrupting the food web. The coastal waters of Washington state deliver an abundance of nutrients to Puget Sound, which helps marine life in the region thrive. Washington’s shellfish industry has annual revenues of more than $107 million, and the Puget Sound region provides 75 percent of the nation’s shellfish. But the abundance of nutrients — enhanced by wastewater of a rapidly increasing population — sometimes leads to algae blooms. In the worst cases, the extreme blooms deplete oxygen levels in the water, resulting in fish kills. 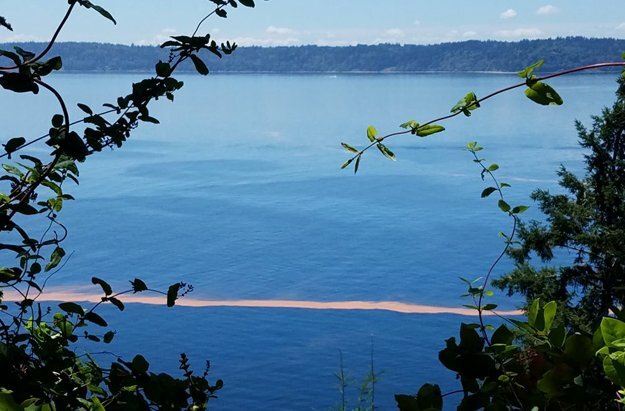 The Hood Canal area is most susceptible to these low-oxygen events because water currents and the canal’s geography (bathymetry) restrict the water’s flow. It’s not quite the stagnant pond water you may be familiar with, but the effect is the same. Sadly, human-induced climate change may be causing more algae blooms. Rachel Carson (1907-1964) was a maverick in her time. Known for her book, Silent Spring, a catalyst for the environmental movement, Carson grew up outside of Pittsburgh, just upriver from my old stomping grounds. Carson studied at the Woods Hole Marine Biological Laboratory and received her MA in zoology from Johns Hopkins. 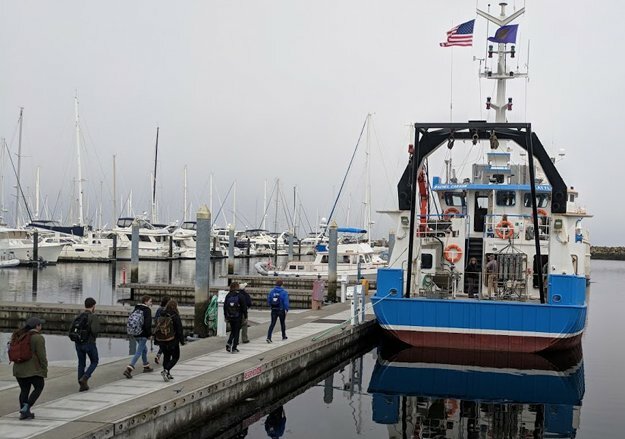 The University of Washington acquired the 72-foot R/V Rachel Carson and converted the former Scottish fishing vessel into a floating laboratory for the UW School of Oceanography for regional excursions in the Salish Sea, which includes Puget Sound. The University of Washington’s School of Oceanography is ranked No. 1 in the world in the latest Academic Ranking of World Universities (2018). Prospective students can climb aboard the R/V Rachel Carson August 17, 2018 on Future Students Day, if I’m not mistaken. Per the link above, advance registration required. The University of Washington is adding a Marine Biology major to its numerous academic environmental offerings, starting in the 2018 Autumn Quarter. Students can study salmon in Alaska, and spend a full quarter at its Friday Harbor Laboratories field station.